On January 17-19, 2018, Mindanao State University at Naawan organized a three-day Gender-Sensitivity Training at the MSUN-IFRD Conference Room. The said training was participated by the Gender and Development-Focal Point System (GAD-FPS) and heads of all Campus Units. Dr. Nimfa L. Bracamonte, Mr. Rashid Bangcolongan, Al Haj, and Mr. Jose Dennis Mancia from the Philippine Commission on Women served as Resource Speakers who talked about GAD History, Issues, Legal Mandate, Planning and Budgeting, and the use of the Gender Mainstreaming Evaluation Framework (GMEF) Tool. The said activity raised the level of consciousness among participants as to the importance of GAD. Not only were the discussions filled with thought-provoking facts and information but also the way the speakers packaged their message was also very powerful and interesting. They had activities that were fun and memorable. Participants were asked to play roles that depict certain GAD issues. 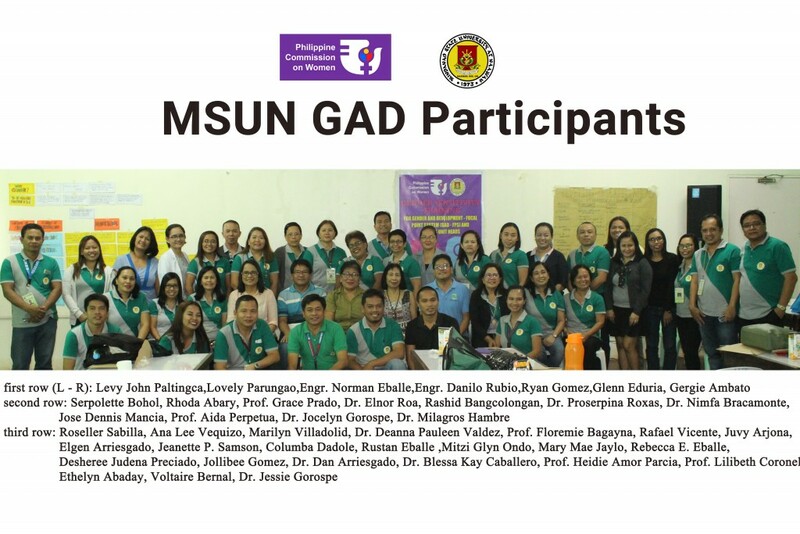 With the active leadership of Dr. Proserpina G. Roxas (MSUN Chancellor) and Prof. Aida G. Perpetua (Chairperson GAD Focal Point System), the Gender Sensitivity Training ended successfully, producing the GAD Plan and Budget (GPB). Gender issues were identified as well as the cause of these problems, and offered possible solutions to these problems.